Fabrication is the last stage of the electronic design process. The PCB information is converted into ASCII output files – GERBER (.gbr), NC Drill (.ncd), PCB Assembly Outputs Generic (.pck), IPC-D-355(.355), Bare Board Testing Generic (.bbt) and IPC-D-356A(.356) which are input to machines to finally create the hardware. All CAM functions are grouped in this module. Design of PCB layout is completed by individually editing artworks of each layer. User has the option to add targets, coupons, thieving and venting areas. Copper pour areas are checked for possible shortcuts or areas isolated by air-gaps. Final artworks are prepared for photoplotting. The standards (RS-274D) and extended (RS-274X) Gerber ASCII formats are supported by the program. 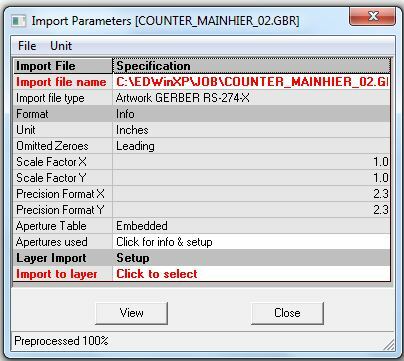 Powerful Gerber ASCII file viewer is an integral part of this module enabling to verify artworks before sending them for plotting and manufacturing. 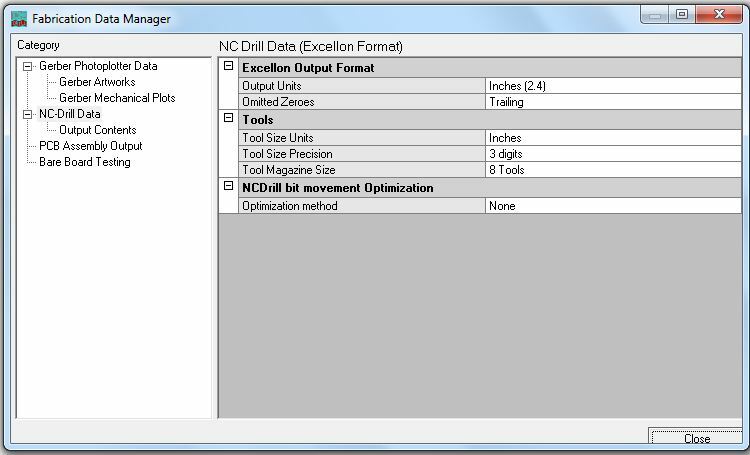 NC Drill data are generated in Excellon format with or without tool movement optimization. Drill templates are created optionally and may be printed or save as Gerber files for photoplotting. This module includes functions for inserting dimensions generation of various mechanical drawings. PCB Assembly output is generated in IPC-355 and Bare Board Testing output in IPC-356A formats. The whole project database may be also exported in GenCAM format. 1. Invoke PCB Layout in the Project Explorer. 2. Select Fabrication Manager from the task list or Select from the task toolbar. 3. The Fabrication Manager window opens with a default board size and gets aligned with the Project Explorer to fit the screen. 4. Invoke Fabrication Data Manager choose Setup from Fabrication. 5. 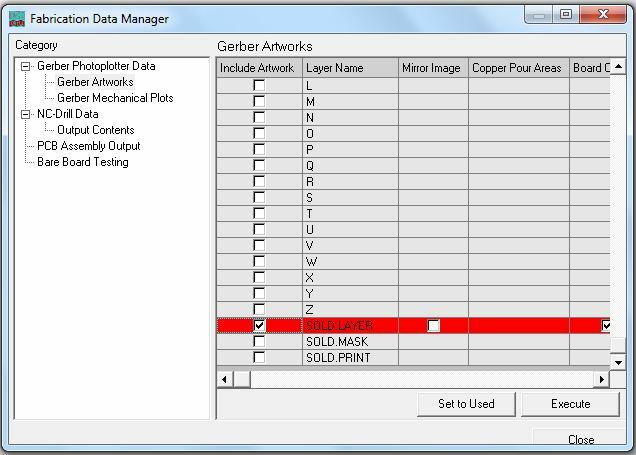 Choose Gerber Artworks in the left pane of Fabrication Data Manager. 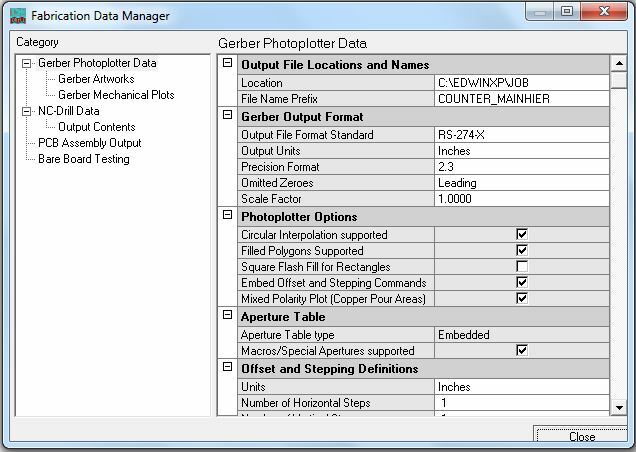 Gerber is the standard format used as input to photoplotters that generate the design data on films. 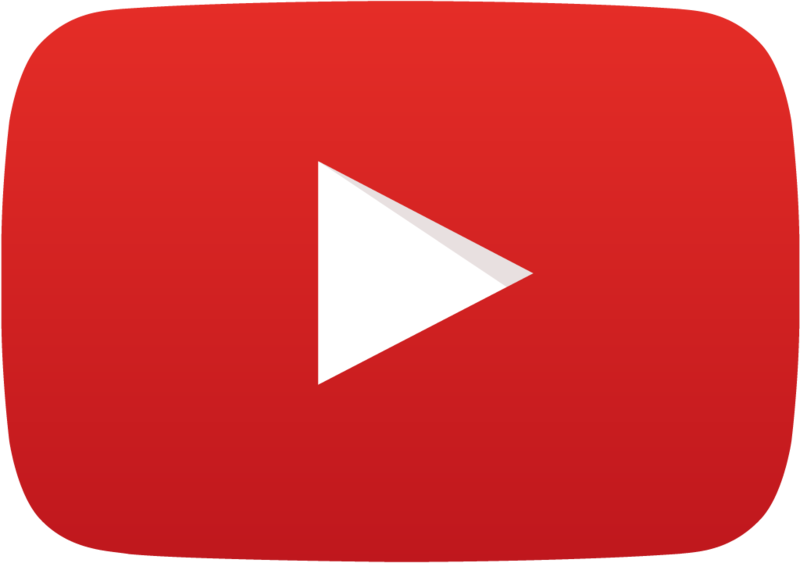 These films are used as masters for manufacturing the PCB, the physical realization of the schematic data. GERBER format is a vector format for defining various elements of the layout. This format represents all traces as draw and the pads that are part of the component footprint as flashes. The Photoplotter uses this command language. 1. Select the layers for which we want the Gerber Artwork files. 3. 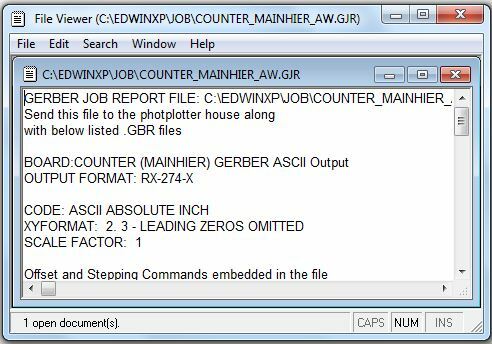 ‘Gerber output window’ opens, Click on Execute. 4. This completes the generation of GERBER data. 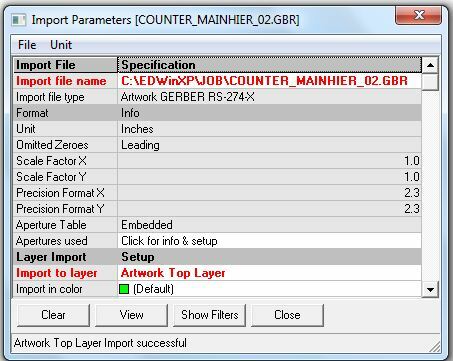 To preview the GERBER data Select File èGerber/ Excellon/ DXF/HPGL Viewer. Different modes of settings may be done using this viewer. A file import dialog box will be open to import files. Select the Files of type as Gerber ASCII files (*.GBR) and select the required gerber file. 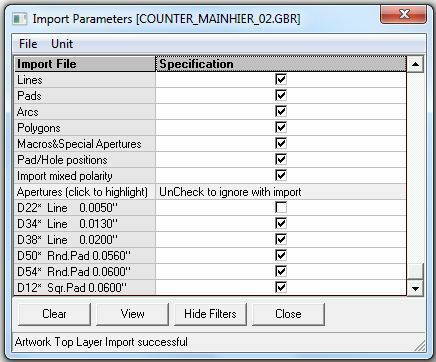 Import Parameters dialog appears as shown below . Select the appropriate layer for importing. Here Artwork Top layer is selected. Refer the figure below. Select the Show Filters option so that the unwanted items can be filtered off as shown in figure below. Uncheck the Imported elements items, which are not required. Since here the artwork top layer is imported, the board items are excluded by unchecking D22* line 0.0050”. Repeat the procedure to import the other layers also in the Graphics Import editor. You will observe the selected layer in the display area. For e.g. in figure, GERBER file generated for COMP.LAYER (with Copper Pour Area) of a project isshown in figure below. The above procedure must be repeated for all the required layers. Note that once artwork files are created it is possible to switch between preview of different layers by direct selection of one of these files. 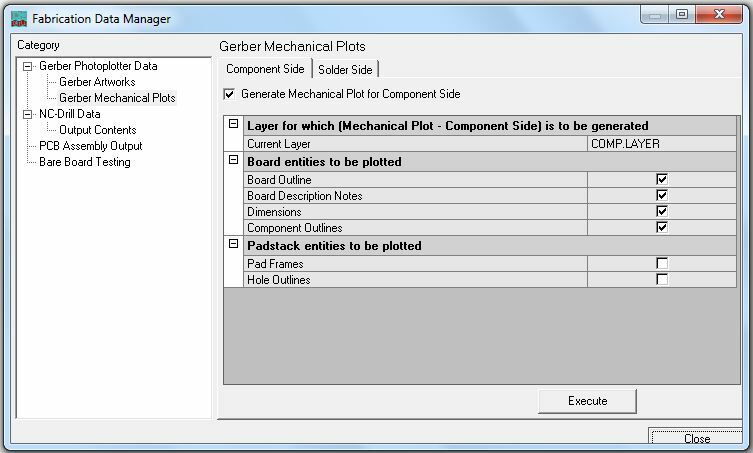 This window allows setting the parameters for gerber mechanical plots on both Component and Solder side. The window opens with the Component Side, by default. Here the Generate Mechanical Plot for Component Side checkbox is unchecked. Enabling this checkbox displays the list of parameters that may be set. 1. Select Fabrication è Setup. This dialog box is shown below. 2. Click Execute, then a Gerber Output window appears. 3. Click Execute. ‘Gerber ASCII output completed’ message appears in the bottom of the window. The output obtained will be a text file. In generating the NC-Drill, the system extracts information about the whole positions, sorts them according to drill size information. The different hole sizes are grouped together and generally sorted to drill in a specific order. This grouping may be done based on sizes, type of drilled hole, like through plated or non-plated, via type like buried or unburied etc. This is generated as a drill tape data. The data may be used directly on any numerically controlled drilling machine. This NC-Drill data is of the EXCELLON format, which is the accepted industry standard. 1. Select Fabrication è Setup è Fabrication data manager è NC-Drill Data. Depending on the equipment used by the PCB manufacturer some parameters must be set prior to generation of NC drill files. Output units - Inches or Millimeters. Omitted Zeroes- Leading or Trailing. 3. Click on Execute, NC Drill Output window appears. 4. 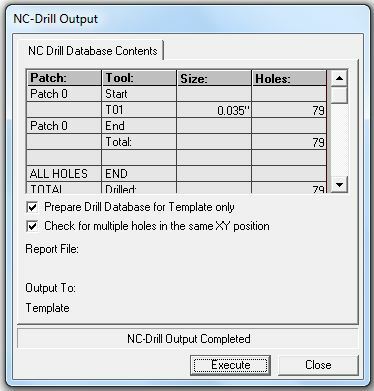 In this window check Prepare drill database for Template only and Check for multiple holes in the same XY position. 5. Click on Execute. In this window after execution displays a message ‘NC Drill Output Completed’. 6. Click Close and Accept Fabrication Data Manager. When the manufacturing volumes are high and high in component density, designs like SMD, manual assembly becomes difficult. In such cases, automatic component insertion technique is required in a specified format to drive automated machinery to position the components at exact location. As this data is machine specific, there is a provision for both Generic as well as IPC-D-355 standard format of the output. 1. Select Fabrication èSetup èPCB Assembly Output. 2. Click on Execute. Output is a extension .PCK extension file. 4. 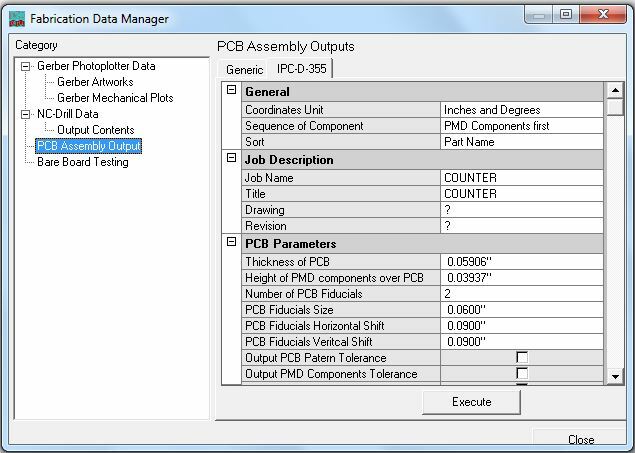 Select IPC-D-355 tab on top of the Fabrication Data Manager window. 5. Click on Execute. Output is a .355 extension file, save it in the desired location. Bare Board Test (BBT) is like quality check usually done by the fabricator to check the open & short circuits in and between the tracks. A supply of 50 volts is passed through the tracks and this job is done by automated machines. A probe sort of thing is inserted through the pads so as to probe. A netlist is generated from the gerber (it is not generated from the design) so that to cross check the actual physical PCB manufactured with respect to actual gerber in order to find out the fabrication errors. This is a special on board test outputs generated in Generic and IPC-D-356A. 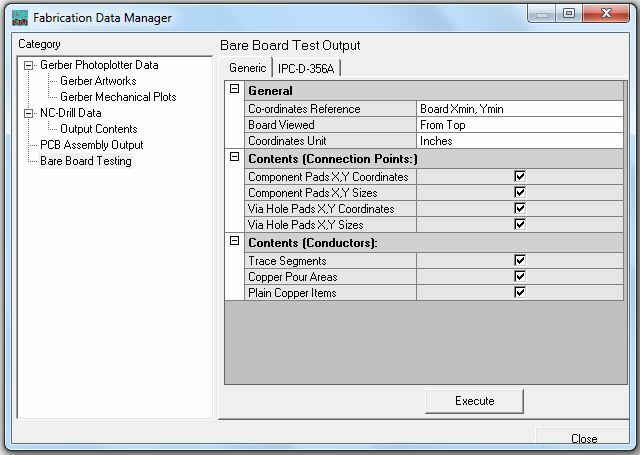 To setup parameters for Bare Board outputs choose Bare Board Testing node from Fabrication data manager choose either format and set the required parameters. Click Execute to generate the Bare Board Testing output in either Generic or IPC-D-356A format. The output for Bare Board Testing is obtained as a text file.